IMS (iPad Mobile Solutions) serves an important role for EMS providers in Ohio where they manage databases and collect pre-hospital data. This includes ePCR (electronic Patient Care Reporting) and Fire Report records required by state regulations for emergency response procedures. From firefighters, to doctors, to patients - IMS provides a full circle of service around the emergency response departments involved in life-threatening situations, maintaining data collection at all times. Currently, there are approximately 100 fire departments and 15 hospitals using the IMS solutions for patient care and billing reporting. IMS manages to keep their business thriving by providing an easy-to-use and efficient reporting solution. They attribute a big part of this success to having reliable solutions powered by a stable sync utility and other plug-ins provided by 360Works. Without being able to work in a static location, emergency responders need to work on their own database copies and then sync with a server to transmit records in various on-site locations such as hospitals, accident sites, rural areas, and care facilities. When supporting mobile users with sensitive information, IMS needed to be confident that medical records were reported and safe. They started by building a system with FileMaker, enabling dispatchers to relay information with CAD (computer aided dispatching) to people in the field. Using the capabilities of FileMaker, the system could collect everything required by the state as part of this dispatching process. However, a challenge began to arise when responders using the app in the field needed updated information on-site with no direct connection, as LTE and Wi-Fi can be non-existent or restricted at times in emergency locations such as rural areas or hospitals. Another challenge was getting emergency responders out of the hospital and back on the road as quickly as possible. This was often a slow process when using paper forms or relying on a slow direct connection to the database to update critical records. At this point, IMS began to research synchronization options for FileMaker. With the fast-paced nature of their work, they needed a synchronization tool, which could provide them with fast sync times, even with thousands or tens of thousands of secure records. Often, reports are filled out in the ambulance while emergency responders are on their way back to the station house, again presenting the dire need for a short sync time to avoid the likelihood of dropping connection during synchronization. "We knew the synchronization product would have to be secure, fast, and extremely reliable. Our operation is 24/7 with zero downtime." When IMS began searching for a synchronization tool for their system, they knew that it would make or break the product. Eric with IMS stated, "We knew the synchronization product would have to be secure, fast, and extremely reliable. Our operation is 24/7 with zero downtime." When syncing from a moving ambulance, MirrorSync was perfect for them because it finishes quickly, and if a connection is lost while syncing data, it intelligently handles incomplete syncs and simply picks back up where it left off, saving a lot of time and hassle for responders on the go. Additionally, IMS needed a sync solution which would work on highly restrictive hospital Wi-Fi networks. Since MirrorSync sends and receives data over regular HTTP connections instead of requiring direct connections to FileMaker Server over proprietary ports, it works perfectly for their requirements. Finally, when dealing with patient records and health information they needed the data transport to be secure. MirrorSync is capable of sending SSL encrypted data, making it an appropriate option to sync sensitive information. We will explore this topic in 5 main categories: Speed, Security, Support, Scalability, and Reliability. IMS has two solutions that they sync. The smaller one syncs a single record with 25 fields in about 2.5 seconds. Regarding the larger, main solution, Jason at IMS states, "We have an ePCR system which is about a 30 table solution and syncs about 1-2 table(s) per second, with 12-20 seconds being the typical sync time for this solution." Eric also mentions this solution that is being synced has several container fields with pictures, medical list, signatures, EKG's and other files. They have about 150,000 records comprised of patient care reports being sent to the server in this particular solution. IMS needed their synchronization tool to be HIPAA compliant to meet requirements for data privacy and security provisions for safeguarding health information. One of the requirements for compliance is that the transmitting of data must be encrypted. MirrorSync is able to send SSL encrypted data to keep IMS patient records protected. IMS reports 360Works support has been great, recalling weekends where 360Works president, Jesse Barnum, provided exceptional support when they migrated their database to 360Works hosting on AWS cloud servers. Additionally, whenever help is needed with a 360Works product, they have reported receiving a very prompt response time from the support team. MirrorSync has proven to perform well regardless of size or volume. There is a growing number of agencies using IMS solutions. In total, IMS reports they have over 500 offline devices being shared by about 4,000 firefighters and medics. Some agencies are making 12,000-14,000 emergency response trips a year, resulting in a tremendous amount of data being synced. IMS needs highly reliable technology options in their data collection methods. Since MirrorSync proved to be extremely reliable and made an impression on IMS, they made the decision to move from hosting with a local data center to 360Works hosting on AWS cloud servers. This was a pivotal point for IMS as they indicated that this has increased their syncing stability and provided them with the capabilities to grow and expand due to "phenomenal bandwidth". 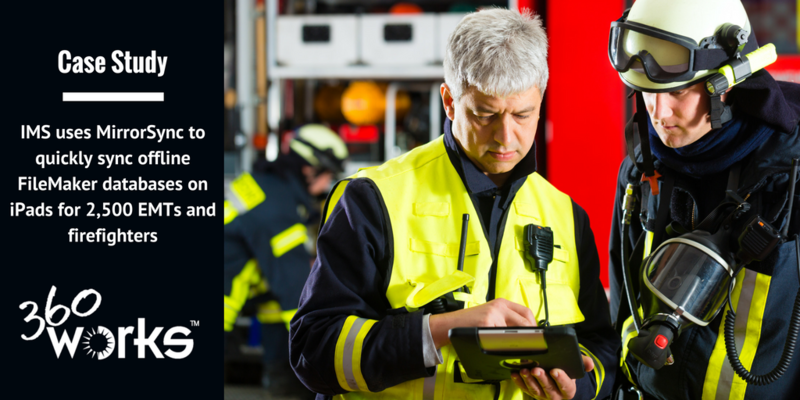 IMS ultimately provided EMS responder agencies with a solution and a sync utility (MirrorSync) that made a tremendous difference in how they worked. IMS never advertised their business, but when other agencies began to notice their personnel using the iPads with their solutions virtually anywhere, interest was piqued. Agencies all over Ohio were still using their old reporting system, and began to ask IMS more about the system they were using. IMS systems are now spreading all over the state, and they are currently working with over 100 agencies. Since the purchase of MirrorSync from 360Works, IMS continues to use other 360Works products to extend functionality beyond the native limitations in FileMaker. With various 360Works products, and the excellent support received when needed, IMS has been able to create powerful solutions that impact the world of EMS providers every day.